Beach cams, Isle of Palms, Coast cams, Folly Beach and more. Videos and drones too! 5 Live Charleston Webcams: Harbor fish Camp, Holiday Inn and more! College of Charleston. Web Cams. The College of Charleston has installed several web cams around the campus to provide a live streaming video 24/7. Edesto Beach is about an hour drive south of Charleston. This web cam refreshes every 8 minutes. My Edisto photos are here. At the bottom of this Folly Beach cam as well as links to other cams. Joseph P. Riley Park has been rated the best playing facility in the collegiate and minor league levels. Windjammer Cam: (Isle of Palms) Choose the cam view from the list on the left Includes: deck cam, band cam and surf cam. Web Cams in the Charleston, SC Region. Sullivan Island's Fire Department, North Charleston, 5267 bridge and more. 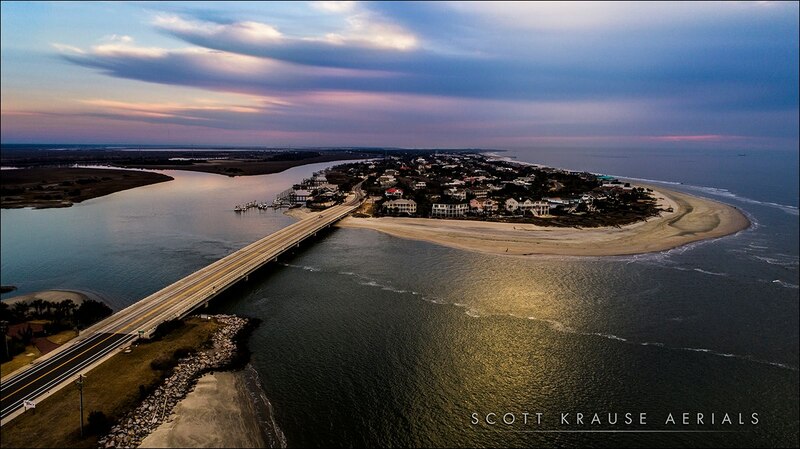 Scott Krause visits Isle of Palms with his amazing drone! This is a one hour sunset in October of 2017 of the Charleston, S.C. harbor You are facing Ft. Ssumter in the background. You will see the Carnival Sunshine Cruise in this drone presentation from Scott Krause. New This might be the first time in the history of commercial shell fishing in South Carolina that a drone has been used to take aerial video of the operation of shell planting as well as assessing the plantin areas afterwards. 360 Panoramas From Charleston. Spend some time with them. They are amazing! New 2017 : The South's Best City! Charleston, S.C. The following drones are amazing! "Aerials by Scott Krause" Click each drone link for maximum enjoyment.. The Tall ships in Charleston! Folly Beach Good time video. Take a Travel & Leisure Tour of Charleston! A Carolina traveler looks at the most beautiful city in America... Charleston, S.C.
Drone over Charleston captures the Holy City. Here's a 360-degree pano of a shrimp boat at Shem Creek. Google Pano Views of Charleston. This is a google interactive map I came upon it when I was searching for the missing panos.